This Radiant diamond is 2.01 carat in weight, and comes with Very Good polish and Good symmetry, as verified from an independent gemological laboratory. The diamond is graded D in colour, and has a clarity grade of SI1. The diamond's GIA grading report number is 1319368101, which will detail further its specifications and measurements, and will also come with the purchase of the stone. This Radiant diamond is 0.5 carat in weight, and comes with Excellent polish and Good symmetry, as verified from an independent gemological laboratory. 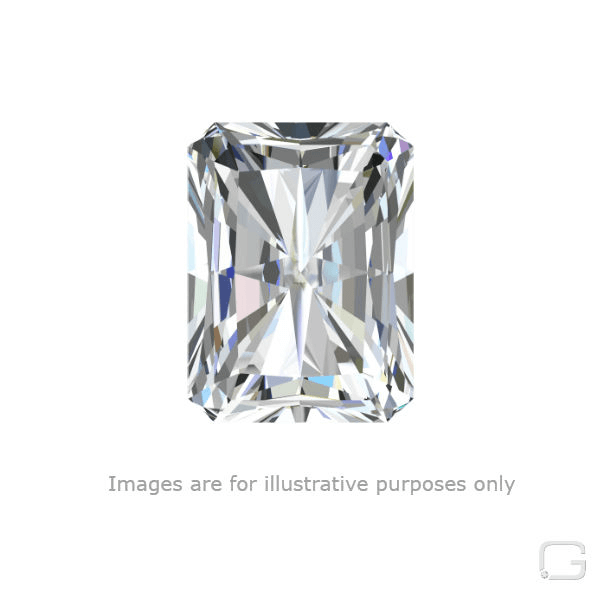 The diamond is graded D in colour, and has a clarity grade of VS2. The diamond's GIA grading report number is 6205442217, which will detail further its specifications and measurements, and will also come with the purchase of the stone. This Radiant diamond is 0.94 carat in weight, and comes with Very Good polish and Very Good symmetry, as verified from an independent gemological laboratory. The diamond is graded D in colour, and has a clarity grade of SI1. The diamond's GIA grading report number is 2111538275, which will detail further its specifications and measurements, and will also come with the purchase of the stone. AUD 5,241 Excl. Duties / Taxes. This Radiant diamond is 1.01 carat in weight, and comes with Very Good polish and Very Good symmetry, as verified from an independent gemological laboratory. The diamond is graded D in colour, and has a clarity grade of SI1. The diamond's GIA grading report number is 16797560, which will detail further its specifications and measurements, and will also come with the purchase of the stone. This Radiant diamond is 0.91 carat in weight, and comes with Very Good polish and Good symmetry, as verified from an independent gemological laboratory. The diamond is graded D in colour, and has a clarity grade of SI1. The diamond's GIA grading report number is 5141020645, which will detail further its specifications and measurements, and will also come with the purchase of the stone. This Radiant diamond is 0.73 carat in weight, and comes with Very Good polish and Good symmetry, as verified from an independent gemological laboratory. The diamond is graded D in colour, and has a clarity grade of VS2. The diamond's GIA grading report number is 7298321629, which will detail further its specifications and measurements, and will also come with the purchase of the stone. AUD 21,516 Excl. Duties / Taxes. This Radiant diamond is 1.4 carat in weight, and comes with Excellent polish and Excellent symmetry, as verified from an independent gemological laboratory. The diamond is graded D in colour, and has a clarity grade of IF. The diamond's GIA grading report number is 6194982159, which will detail further its specifications and measurements, and will also come with the purchase of the stone. AUD 3,473 Excl. Duties / Taxes. This Radiant diamond is 0.71 carat in weight, and comes with Excellent polish and Very Good symmetry, as verified from an independent gemological laboratory. The diamond is graded D in colour, and has a clarity grade of VS2. The diamond's GIA grading report number is 6265570228, which will detail further its specifications and measurements, and will also come with the purchase of the stone.